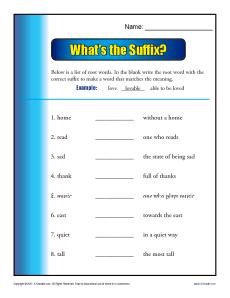 Now it’s time to write a word with a suffix! Your student is given the root word and a target meaning. He’ll write a new word by adding the appropriate suffix. It’s a great drill for 3rd grade Common Core Standards for Reading: Foundational Skills, but you may also use it for other grades as needed.